Manmade Electromagnetic Frequencies (EMFs) Significantly Suppresses Health. HelixLife Pendants, LightTowers and PowerConditioners neutralize EMFs at the point of interaction with the cells, resulting in an EMF-free environment for intercellular communication and processes to function. There are an increasing number of studies showing that manmade high frequency electromagnetic fields (HF-EMF) and radio frequencies (RF) constitute a genuine environmental threat to all biological systems, including human health and longevity, healthy plant growth, vitality and crop production and animal health and growth. EMF is created anywhere electricity is generated, distributed or used; and RF comes from broadcast sources, microwaves, wireless technology, and cell and radio towers. Both EMF and RF create random disorganized energy fields that disrupt natural processes in biological systems, people, plants and animals. Research has shown that biological systems do react to HF-EMF of even small amplitudes causing cellular and molecular responses and alterations of the whole systems growth and developmental. Homes and farms located within sight of cell towers or high-tension wires have certain high exposure but even those at a distance - and the people, plants and animals that live in them - are at risk for disruption because the magnetic waves easily cover 10-20x the distance of electronic frequencies. Since HF-EMF is not going away, and the expansion of technology (ie the result deployment of 5G in some U.S. cities) with the increasing demand for power ensures a growing footprint of HF-EMF producers. The negative load placed on biological systems will continue to increase. HelixLife offers a biocompatible, truly novel solution to shield biological systems from HF-EMF, stabilize intercellular communication and oxygen saturation and boost health and productivity to achieve a truly new normal level of performance. People, plants and animals, at the subatomic level, use nature’s communication network of low electro-magnetic frequencies (EM) to function and communicate. When this natural EM is disrupted or suppressed by HF-EMF, the results are suboptimal performance. The problem is we have become accustomed to this level of performance and believe it is normal. Manmade HF-EMF operates at much higher frequencies than EM and disrupt and suppress the natural biological functions and cellular performance. Natural EM and the earth’s frequencies are below the 20Hz range whereas manmade EMF/RF are at high frequencies above 50Hz, many in the megahertz to gigahertz wavelengths. For instance, Smart Meters emit 900,000,000 hertz pulses every few seconds, but the human body operates at 8 hertz. Because these high frequency wavelengths do not naturally occur and since living systems are not perfectly dielectric (electrically insulated) the EMF is picked up by our systems, and interferes with tissue growth, cell function, and overall body, plant and animal health. EMF exposure is not just from immediate focussed exposure but also from the overall blanketing effect of EMF across the country. 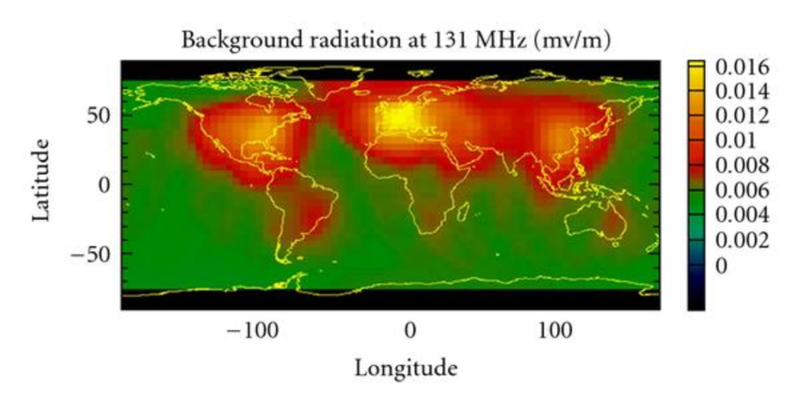 Below is an image of just the 131 megahertz range of EMF. As you can see the coverage is continuous across the entire developed world. An advanced form of science sheds light on the problem at the sub-atomic level. Biophotons (photons in living systems), which are subatomic light particles, are the minute packages of energy that carry the information of life inside and between cells. Many studies show these biophotons engage the electrons to provide the necessary information for what and how the electrons are to behave. For plants, from photosynthesis to energy storage, growth, nutrient flow, healing and the transport of water, clear biophotonic messaging is very important. In every living cell, there are about 100,000 vital biophotonic chemical reactions happening every second. The human body is a walking chemical reaction, and yet, until HelixLife, very little has been done to optimize these reactions naturally. The biophotons give molecules their orders, for time, location and action to completed. Biophotons have an extremely high degree of order and stable intensity. This order and intensity is called coherence and with this high coherence, the message submitted by the biophotons gets very clear and direct, reducing friction and stress which improves energy flow. Living biological systems have much better coherence than we can create with technology. The best manmade laser can only maintain coherence for about 1/10th of a second whereas the coherence in people, plants and animals are in the order of days or even weeks. This allows biological systems to communicate with the highest possible clarity when free from EMF and RF interference. Using an oxygen molecule as an example, the molecule carries 6 electrons in its outer shell. The HF-EMF/RF causes incomplete or scrambled instructions and this interference can cause a gain or loss of an electron causing the molecule to become chaotic for a time, unbalanced and impaired, unavailable as an oxygen molecule for that moment. Since cells converse intercellularly with light, the message can be sent with very high efficiency so long as the communication is clear and clean, containing the maximum amount of information, as happens in naturally low EMF and RF environments. However, if there is “noise” (interference) from outside, manmade HF-EMF/RF, then the message can become garbled, incomplete or not received at all. This reduction of communication acts like a suppressive blanket on optimal potential as the biological system works harder to overcome the challenges to thrive. Essential processes for life still take place but at a reduced rate of performance. The interference suppresses the cells’ normal healthy function of nutrient flow, removal of toxins, regeneration of cells, and damage repair. If EMF is putting constant pressure on living systems, the ‘normal’ we ascribe to plants is this state of suppressed performance. We can radically change this with the introduction of the HelixLIfe product line of Pendants, LightTowers and PowerConditioners. With over 22 years and over $11 million invested in research, development and trials, we have found a scientifically sound solution to remove the suppressive blanket that HF-EMF and RF places on all living biological systems, including humans. The technology is based on over 30 years of Russian and German research in the fields of Ions, biophysics, biophotonics and EMF effects. HelixLife’s family of products are a series of precision plates embedded with harmonic base frequencies powered from the earth’s natural ambient magnetic fields and photonic light energy. Unlike any other EMF product on the market ours operate to mitigate EMF on both the electro and magnetic frequencies. This has the balancing effect that allows us to push the effects out for very large coverage. Our larger Power Conditioners can cover over 500 acres easily with no diminished effects. (see our commercial site for more info) They produce a base resonance, much like pinging a tuning fork, which creates a carrier harmonic that allows all the electrons, whether in the air, liquid or solid, to sit at a stable, more cohesive energy level. It is at this efficient energy level that sub-atomic communication between biophotons and electrons becomes very quiet, allowing the maximum potential information transfer which produces the ideal environment for health and wellness. First off, they create a shielding environment blocking the HF-EMF/RF. Second, they stabilize and increase the efficiency of chemical and biological reactions enhancing inter-cellular communications and strengthen the natural biological systems. The Pendants, LightTowers and PowerConditioners create a non-invasive healthy 3D environment that shields and strengthens the biological systems where tissue and cellular processes function at optimal potential. PowerConditioners work in most environments, Indoors and out, house, apartment or building. LightTowers can be worn or held to conduct treatment sessions. Pendants are low power and are helpful to maintain the benefits realized from the LightTower and PowerConditioners. They are helpful to wear when not within the range of the PowerConditioner. We have Power Conditioners that have been in the field for over 20 years with no diminished effectivity. We are continually improving as we further our research and as of November of 2017 we just created a more efficient suite of Power Conditioners based on recent field research. Because of this development all new Power Conditioners have an increased effectiveness of +10%. Note: The results we list above are not created by the device, they are simply the response we expect from biological systems when the suppressive effects of HF-EMF/RF are removed, and the plants are able to function at their true optimal potential created by the HelixGrow devices. Our devices differ from most solutions as they do not touch, add, alter or tweak anything on the plant or ground. They are simply letting nature take its best course- that of healthy, robust wellness. HelixLife's Embedded Resonance Technology supports you by strengthening and promoting your body's natural bio-response in everyday life. Your body is designed with natural rhythms, such as the circadian rhythm, which can be knocked out of balance from stress and overuse of technology. Your body constantly struggles to regain it's natural rhythm which may lead to fatigue and feelings of being overwhelmed. HelixLife provides the extra support needed to overcome years of stress and illness. Customers say the Pendant and LightTower provide extra energy, clearer thinking and much more restful sleep then they are used to. Shielding the body's systems from disruption caused by unnatural EMFs, listed as a possible carcinogen by the World Health Organization. Optimized inter-cellular communication with improved metabolic function when oxygen saturation is increased and ion balance is achieved. Overcome the deluge of positive ions and experience life in balance. Naturally start removing free radicals. Improved autoimmune resistance and sleep patterns. Studies show protecting from EMF improves autoimmune disease in 95% of cases. Observe blood oxygen saturation increase in minutes. ​Improved muscle performance and recovery. Your body responds with more energy, strength and pain-free movement when wearing HelixLife products. Improved autoimmune resistance and sleep patterns. Pets live in the same environment as us, and suffer the same severe effects from electromagnetic stress. The LightTower has been used to reduce tumors and pain in pets and animals of all sizes. Attach the Pendant to a collar for daily support. Shine the LightTower over the problem area for powerful, timely results. Casting a protective array throughout the home allowing all to live with technology and thrive. Lemons during first year with the Power Array. Remove environmental stress and energy goes towards growing fruit, not fighting stress. Improved autoimmune resistance and sleep patterns for all those in the coverage area. 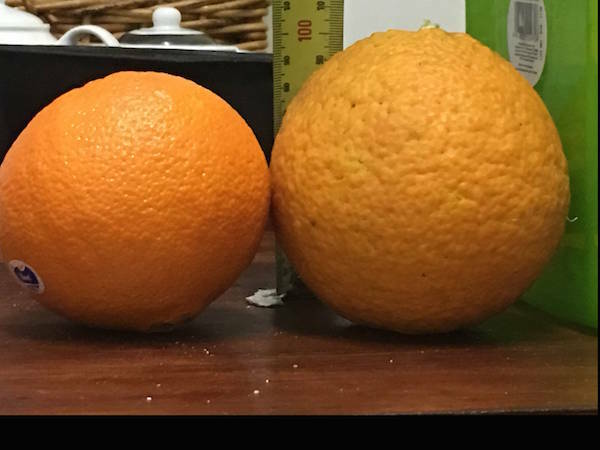 Orange on right after 2 years with Power Array in orchard. Orange on left from an orchard without Power Array. Nutrient flow improves quality and yield.